Wildcat offers two great solutions to keep your greeting card boxes closed. 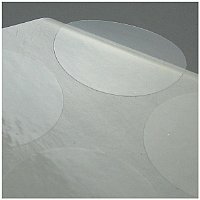 Our Clear Round Stickers are a perfect way to seal your greeting card boxes to prevent theft. They are super clear and very secure. Wildcat's elastic loops are a great way to secure your greeting cards. Each loop is 1/16" in diameter and is tied in a simple yet elegant bow. You can stretch them from corner to corner or around the width of the box. Wildcat's elastic loops are a proven way to help prevent damage and theft while moving through the retail supply chain, plus they look great. Gold and silver loops are availble. Must order in multiples of 50 (50 minimum).